What is this mystery object? Answer at the bottom of the page, but don't cheat! It's the time of year when the seeds start to appear. On the left, the ripe pod of the Bush Vetch. 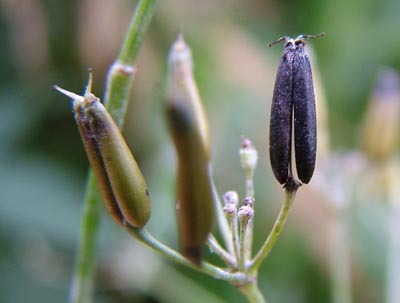 On the right, seeds of Goosegrass or 'Sticky Willie'. These are the opening sori of Lady Fern. The brown spores are just visible. 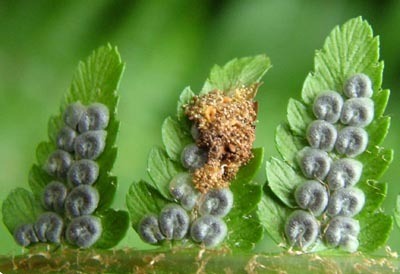 And the spores of the Male fern are just appearing, too. The right image shows micro-moth damage to the sori or spores. Maybe Psychoides filicivora. More seeds: Nipplewort and Hedge Woundwort. I think the seedheads of many plants are very attractive in their multiple symmetries. The Mystery Object revealed. It's the seed of Cow Parsley, cunningly disguised as a moth or beetle. So why would a plant do this? Obviously not to attract insects for pollination; that took place ages ago. So it must be to attract insect predators such as birds. The birds will either swallow the seeds or reject them once it has found out about the deception. Either way the seeds are dispersed more widely than if they had just fallen. Brilliant.